Cycling is a relaxing and environmentally friendly activity as well as a means of transportation. Bicycles have gained a lot of popularity over the past few reasons as people became more preoccupied with the environment. At the same time, traffic congestion made a lot of people realize that cycling can be a great way to get around the city. One thing that most people forget about is cycling glasses. For a lot of people, they might seem unnecessary, but the truth is that they do help a lot when cycling. These glasses protect the riders, from dust, insects and even water. They are meant to cover the eyes better than regular sunglasses. Riding at high speeds is nearly impossible without such a pair of glasses. We decided to pick the most popular models currently available that are inexpensive and offer decent functionality. To run it short, let us get right into the list of the top 10 best cycling glasses. F-sport may not be a brand with which many are familiar but their products are more than decent. Their outdoor cycling sunglasses are a good pick for the ones that ride both inside and outside the city. They offer good protection and they are fairly durable. The glasses themselves are made with a flexible plastic frame and an extra wide lens. It actually includes 3 interchangeable lens and one of them is polarized. It also has a clear lens in a yellow color. All of them offer UV400 protection. In terms of design, the glasses have a typical sports design which makes them suitable for other sports as well. They can be used for skiing, golf, cycling or even hiking. They are available in 3 different frame colors and come with a decent price tag. 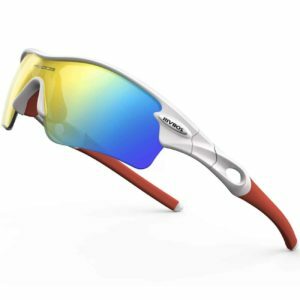 abaolux sports sunglasses are more of a budget pick. They are inexpensive and get the job done without any bells and whistles. The glasses have a typical sports design with an extra wide lens and a thick but durable frame. The frame is made from a flexible material which prevents them from cracking or breaking apart. One useful aspect is the fact that the glasses come with a total of 5 lenses. The main lens is polarized while the other ones have various tinting colors. They offer 100% UV400 protection and are very easy to swap. As far as versatility goes, the glasses can be used in all seasons, day and night and for a wide range of sports. The clear lens will prove to be the most useful one while the tinted ones will be more practical on sunny days. 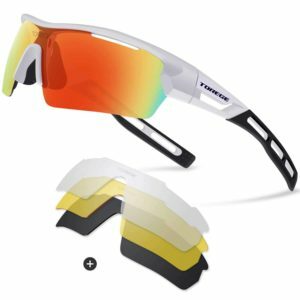 Torege is not such a big name when it comes to sports sunglasses but they do make competitive products. Their polarized sports sunglasses are made to be durable and practical. The flexible and rubberized frame ensures that they always stay in place and will not get damaged even when dropped. The glasses can be found in 10 different colors and for a reasonable price tag. They are all made from polycarbonate and will fit quite comfortably. The rubber nose pads makes them comfortable to wear and their design makes them suitable for cycling and other sports. Like most other sunglasses, they have interchangeable lens. They are all UV400 protection coated and come in different colors to suit every situation. The manufacturers offer a lifetime warranty on the frame and have a 30-day money back guarantee. 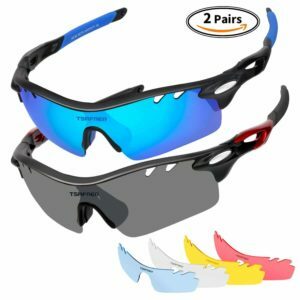 Tsafrer sports sunglasses are a must-have accessory and not only for the ones passionate about cycling but for hikers, joggers and many others that enjoy spending time outdoors. They are sturdy, inexpensive and reliable. Like most sports sunglasses, they were made to last. Their frame is flexible and shatters resistant. The lenses are scratch resistant and have a wide design to offer protection on the sides as well. For the price, Tsafrer offers a great deal. The kit includes two frames and six interchangeable lenses. All of them have a UV400 coating to protect the eyes against UV light. They are easy to swap and available in several different colors. The BATFOX sports sunglasses are great for cycling for a simple reason. They offer great coverage and protection. The wide lens protects the eyes from all angles while the soft frame ensures a comfortable fit. Like with any type of sports sunglasses, the model features lenses that are UV400 protection coated. 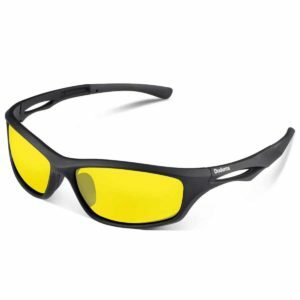 They are available in multiple frame colors and include several interchangeable lenses. Sadly, none of them are polarized. In terms of comfort, the frame has a soft silicone coating that prevents them from slipping and provide a better fit. They were made to be shatter resistant and difficult to break. The glasses are available in one universal size. 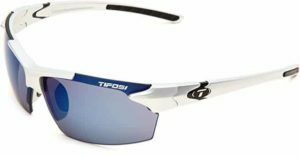 Tifosi cycling sunglasses are a bit more stylish than most other models on our list. They have a simple and practical design with the individual lens that is extended to cover the sides as well. The lens is not interchangeable and the glasses have just the lens they come with. The glasses are a bit more expensive when compared to other models but they do have a more premium construction. They use durable polycarbonate lens that is scratch resistant and has 100% UV protection coating. For the frame of the glasses, several silicone inserts have been used. Their purpose is to make the glasses more comfortable to wear and prevent them from slipping. The manufacturers offer the glasses in 8 different combinations of frame and lens colors. J+S Active PLUS cycling glasses are a great pick for active individuals. It is a simple pair of glasses with a light frame and a durable construction. They are flexible and will not break. At the same time, the lenses are scratch resistant. To ensure proper protection, the lens has a UV400 protection coating that blocks UVA and UVB radiation. They are fairly durable and scratch resistant ensuring that they will last for a long time. In terms of usability, the glasses are advertised as being for cyclists but they can be used for other outdoor activities as well. The clear lens version will prove to be better suited for nighttime activities while the other models have a slightly darker tint. RIVOS sports sunglasses are an ideal choice for the ones that enjoy spending many hours on their bicycle in and out of the city. 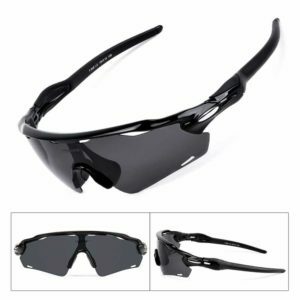 They are fairly simple and look like a regular pair of sports sunglasses but the protection they offer and the low price tag makes them very competitive as a product. The sunglasses use high-quality polycarbonate lenses that are designed to resist scratches and endure heavy usage. They have UV protection coating and are available in various tin colors. 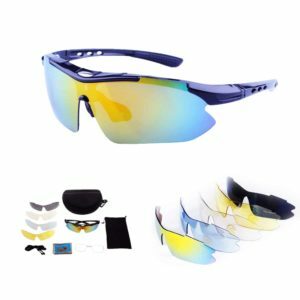 The kit includes 5 interchangeable lenses out of which 2 are polarized. As far as choice diversity goes, RIVBOS offers their sunglasses in 5 different frame colors. The frame is made from a flexible material that allows them to twist and bend without breaking. 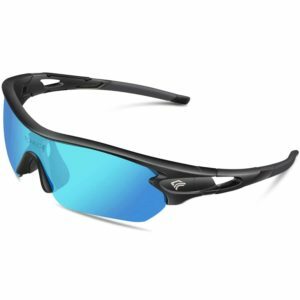 TOREGE sports sunglasses offer a great deal for the money. For a modest price tag, the user will get a full kit including the frame and no less than 5 interchangeable lenses. They have various tinting color and are scratch resistant. Like most other cycling glasses from our selection, the frame of this model is made using soft plastic materials that will not break when bent. They have a simple design that makes them comfortable to wear and a rubber nose pad to prevent them from slipping. The lens themselves are all UV400 protection coated. They can block both UVA and UVB rays and come in various tint colors. As a bonus, the manufacturers offer a lifetime warranty for the frame in case it breaks. 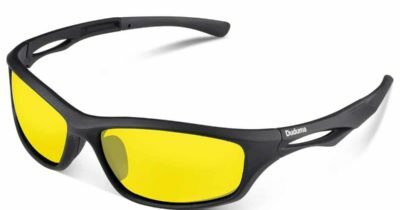 Duduma sports sunglasses are by far the most popular pick for cyclists and many others. It is an ideal choice for hiking, trekking, running, skiing and many other sports. They have a modern and stylish design and a rather modest price tag. 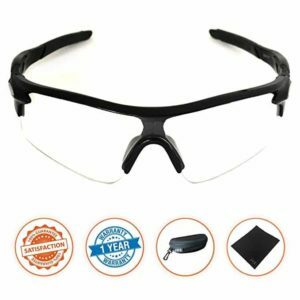 Unlike other cycling glasses, these ones do not have the interchangeable lens but this does make them more reliable as the lens will never fall out when the glasses are dropped and will not become loose. Duduma also offers the glasses in several variations for lens tint and frame color. An interesting bonus is the fact that Duduma offers a lifetime warranty for their glasses and will replace them if they break. They claim that both the lens and the frame are extremely difficult to break. It is difficult to tell what makes a pair of glasses great for cycling. Usually, most glasses are not specifically designed for cycling but they can be used for this activity as well. It is safe to safe that most cycling glasses actually have an all-purpose design that gives them versatility and make them much more practical. Since we picked 10 different models for our list, picking one out of all of them can be a bit confusing since they do tend to be quite similar. There are some discreet characteristics that make them different or suitable for certain situations. Here are some important aspects to take into account. Interchangeable lens. Interchangeable lens is a good feature to have. Most glasses that have interchangeable lens also come with extra ones with different tint colors. The ones that do not have interchangeable lens are a bit more durable and the lens will never fall off. UV protection and polarized lens. Not all glasses have polarized lens. They can be quite useful especially on a sunny day. However, all glasses in our list have UV400 protection coating. Frame and lens quality. Usually, cheaper models use cheaper lenses. A high-quality lens needs to be scratch resistant and the frame has to be made from a flexible material so that it does not break when dropped. Some manufacturers even offer a lifetime warranty for the frames. Riding a bicycle in the sun or during a windy day is not that fun without a pair of cycling glasses. They can help offer a certain degree of protection and block harmful UVA and UVB rays. Not all cyclists use these types of glasses but the ones that do usually never leave home without them. 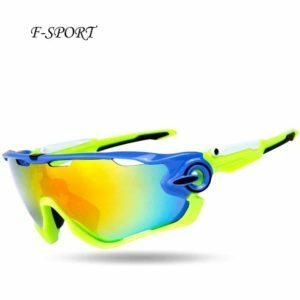 Truth be told there are hundreds of cycling glasses and the big brands, while they might offer high-quality products, they have highly inflated prices. The more inexpensive models are quite decent and competitive. For our list, we picked a good range of cycling glasses that are affordable and practical.